My cats always know when a holiday is coming. I don’t know how, but they do. They start getting very curious, especially around the refrigerator. Meats for holidays are not uncommon in the refrigerator any time of year, but they somehow know that turkey, ham, beef is for something special-and they want a piece! They all know they can’t have ham. There’s an enzyme in pork that give cats heart attacks, so I don’t give them any. But that doesn’t stop them from begging! Looking at us with pretend hungry eyes and feigning imagined abuses doesn’t get them any pork, but it does get them extra treats. So, not all is lost! Shorty and Pippie were especially demanding when it came to holiday meat. Both would sit on a chair at the table and demand to be served. Cute, but they still didn’t get anything! Shorty in particular was very sneaky. She would quietly get on one of the dining room chairs and during your meal a black paw would quickly appear and always landing on my meat. She would pop up her head as if to say “I touched it, it’s mine, now gimme my food!” And who could resist? She always got a little piece of meat if it wasn’t pork! 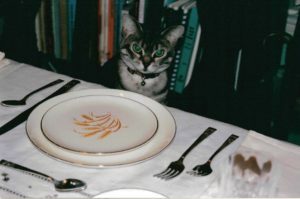 Pippie at the Thanksgiving table, demanding all the turkey the plate would hold!